Bobby Bishop released his debut effort, Government Name, quite some time ago on Beatmart Recordings. Government Name ended up being a pretty decent hip hop disc, with good music but a flow that varied between strong and sort of weak. His sophomore album, Everyday Man, continues that trend a little, but actually steps it up some. There are still some points of weakness throughout the disc, but Everyday Man turns out to be a great follow-up. To get sort of an idea of what Bobby Bishop sounds like on Everyday Man, it can be described as somewhat of a mixture of manCHILD from Mars ILL, Heath McNease and maybe a little bit of John Reuben. For the most part, his flow is pretty tight this time around. Good examples of this are in the "Prologue" and "Epilogue," which begin and end the album, respectively, and also have the same beat, music and vocal pattern. You can also find it in songs like "Mud From My Eyes," "King," and T.I.M.B.S." He even finds time to sing in "Everyday Man." The beginning of the song (the part before the beat comes in) sounds a little rough, but afterwards, the rest of the song sounds great (this is where the likening to Heath McNease comes in). Bishop has had a lot of time to work on his craft since his last release, and it's obvious that it was time well-spent. There's a noticeable maturity between Everyday Man and Government Name. Perhaps it's the changing of record labels, as Beatmart (the label that released Government Name) was known for signing an array of hip hop artists, some of whom just didn't have what it took to make it. Government Name displayed talent and showed potential, so it's good to see that Bishop was able to find a new label and actually come back with a sophomore album. Aside from the flow, the music is quality as well. "Mud From My Eyes" is kind of jazzy with some piano and a little bit of guitar, with the piano continuing in beautiful fashion in "Launch." 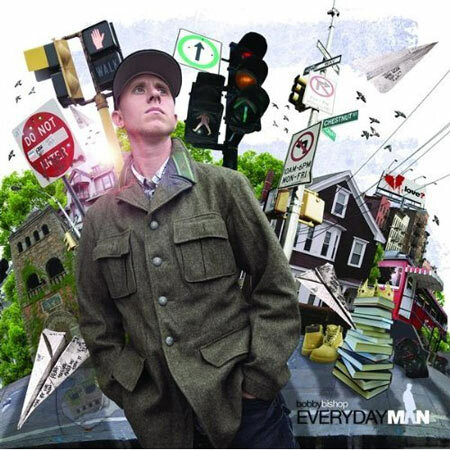 The music of "Everyday Man" sounds almost like something you may hear from a mainstream pop singer (not the Beyonce-style pop music, more like the Colbie Caillat-style). "T.I.M.B.S." hits a little harder than the rest of the album, with a strong (yet slightly corny) hook, and "If This Is Love" shows a little return to that jazzy sound shown at the beginning, but retaining a hip hop sound in the beat and some of the background music during the verse. "If This Is Love" also speaks a strong message that warns girls to watch out for guys that say they love, but treat the girl like a piece of property. But don't worry, the track has a happy ending. As I mentioned earlier, Bishop's debut, Government Name, showed potential and had some highlights here and there. He certainly took a good look at what he needed to do in order to produce a quality hip hop album on his second go-around and did it. It does have some weak areas, though. His flow could still use a tiny bit of polishing (though, in all honesty, I can't find many rappers that I can't also say that about), and there are some hooks that probably could have been replaced with something else that may have improved the outcome of the album, or at least that particular song. The two main examples of this are "Welcome Home" and the almost-obnoxious "If This Is Love." But really, there aren't that many cons, which makes Bobby Bishop's Everyday Man a hip hop album worth checking out.